We all want a lovely home right? And fragrance’s a big part of that. Gorgeous flowers. Fresh coffee. Baking. They seem to say so much about us. SO we’re all vulnerable to ALL those products promising to make our homes smell “nice“. But they don’t actually transform our homes. Do they? Or us? So then we buy some more. And before we know it we’ve a cupboard full of now grotty candles, oil burners and what nots. 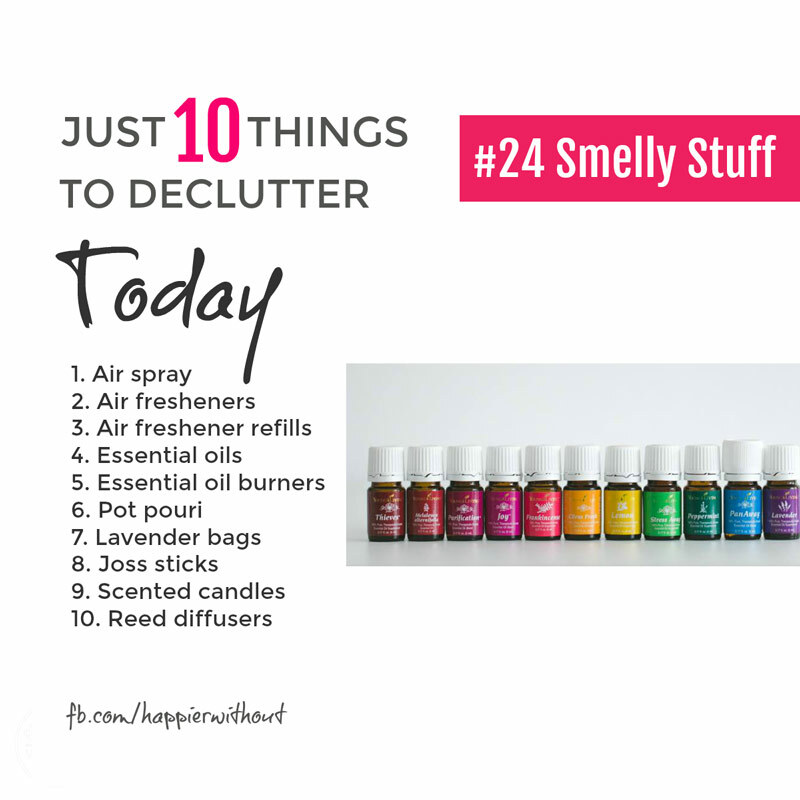 So today let’s ditch all the smelly stuff doing nothing to make our home more welcoming. … and ditch what you can quickly. Now as we said yesterday, these seem tiny. Like they won’t help our BIG clutter problem. BUT it is actually the hundreds of tiny things we have that MOST overwhelm us. And can be the HARDEST to clear. Because we don’t get a big boost letting go. So we need to weave all our little collections of tiny, grotty stuff into our daily declutters. We get bolder & bolder at saying NO to grot! Lots of us are ashamed of our homes. We avoid visitors. Even close friends. And that stress can lead us to shop more. But the answer is never in new things. Friends worth having love us for who we are. And we need to take our lead from them. And love ourselves a bit more. And that means having some clutter-free treats up our sleeve for when we’re down. It could be coffee out. A movie. A walk in the park. A little trip. Whatever works for you. But its worth making a little list. And building them into your week. Making them habits. So when you’re super depressed about the clutter and state of your home, you’re NOT tempted to go shopping!